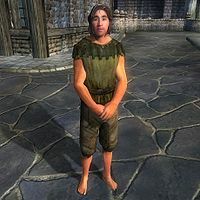 Foul Fagus is an Imperial beggar living in Skingrad. He sleeps rough from 10pm until 6am on a bedroll between the city wall and the shelter in the area behind Colovian Traders. He then wanders around the steps of the Great Chapel of Julianos until 10am before trying his luck in the area between Summitmist Manor and the city gate until 2pm and then outside the West Weald Inn until 6pm. If he has found any food during the day, he will spend from 6pm until 8pm eating it, otherwise he will go hungry and stand around forlornly. He then spends two hours wandering near his bedroll until 10pm before sleeping once more. Fagus certainly qualifies as poor; his only possessions are the belted braies and flax tunic he wears. He is infected with the diseases Bone Break Fever and the Shakes, and you can be infected should you engage him in combat. For a small fee, he will provide some useful information about the disappearance of Theranis during the Thieves Guild quest Lost Histories. He is also one of the "poor and suffering" to whom you must speak in order to receive speechcraft training from Tandilwe. Esta página foi modificada pela última vez à(s) 23h50min de 14 de maio de 2015.